Nine years ago, I took part in the 18th Annual High Country Triathlon in Banner Elk, North Carolina. Immediately afterward, we went on a family camping trip. We prepared more for the camping part of the trip than I did for the race. Nonetheless, something started there and shortly after completing that first race I registered for a 70.3 the following spring. 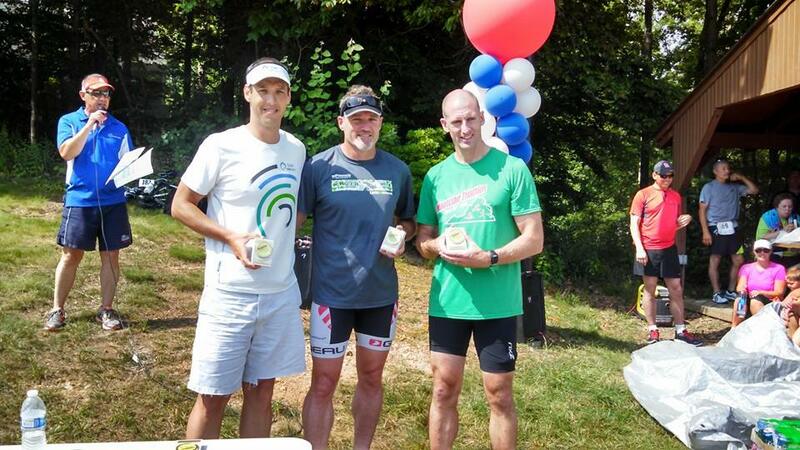 The race has its charms — a lovely little lake, an out-and-back bike course that climbs and descends over the local ridge line of the Appalachians, and a one-of-a-kind reverse order to the events with the five kilometer run coming first and the finish line on the beach after the swim. Last weekend I went back to the sprint distance for the first time since that rookie race. I rode my own bike instead of borrowing a friend’s bike. I didn’t crash. I was able to run the whole way with no walking. And, I may have had as much fun as the first time out. I’m not really sure how the results work because I was awarded the top place for my age group but the guy who won fifth place was 40 years old but listed in an “Open” division. He also turned in the fastest swim split and fastest bike split of the day. Wearing the club gear and holding my new paperweight. Old men can still race! I’ve now done 26 triathlons. I’m going to keep at it as long as they stay fun. If Montclair is an indicator, they will be fun for quite a while. I was passed in the last few meters of the run by a hard charging 15 year old. I could hear the crowd urging us on and he was obviously closing a gap, but there was nothing I could do. I simply had no more juice in my legs. As it turns out, according to the magic of Garmin the last little bit of my run was at a 5:46 pace and my heart rate spiked to 163. He still blew the doors off of me. Speaking of run splits, I did a 7:24 followed by a second mile at 7:49. The second mile was nearly all uphill at about a two to three percent grade. The last mile came back down to 6:56 pace. Those are respectable times but when you note that my swim and bike splits were both top ten and I only turned in the 55th fastest run, it is clear where I need to focus. My average cadence on the bike was 92 and it got all the way up to 117. That is good — I’m finally developing some of those fast twitch muscle fibers. The power and speed numbers for the bike are a bit hard to read. It seems that I forgot to hit stop on the Garmin as I racked my bike. As a result, Garmin thinks my ride was three hours long. If you look closely, you can identify where I put my feet in the shoes in the first two minutes and the four distinct U-turns where power dropped to zero. The maximum average power over 20 minutes was 264 watts and I did an average 259 watts over the 31 minute ride. I had been hoping to break 270 which is the number I did in a test last month and produced my current FTP of 257. Alas, I think the downhills did me in. 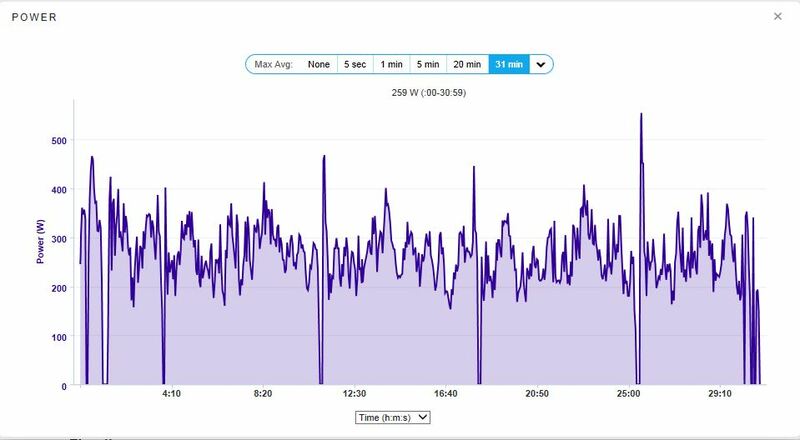 Even though I kept pressure on the pedals and used every gear on the cassette, at several points you can see the power drop down around 200 watts. My strongest one minute average power came right at the beginning. There is a 5 percent grade up to the main road and the second minute of the bike shows a 325 watt average. There isn’t much to say about the swim. I wore the Roka Viper speedsuit and I love it as much as the day I got it. I took off to the front of wave three at the start, was caught by the eventual swim “winner” just after the first 100 meter buoy, tried to draft but only stayed with him for another 75 meters or so, and then chugged along until I was finished. I took a Gu Roctane about 20 minutes before the swim and two sips of Perform during the bike but otherwise didn’t worry about food and energy until it was all over. I really like racing with the data on the bike but the course was crowded enough and we were going fast enough that I didn’t spend much time looking down at the Garmin. Both transition times were about one minute and change (1:38 and 1:28). That is good and can always be better. At this URL, you can find short video clips of me running across the beach after the swim and coming into the finish chute after crossing the dam. Funny thing, the 15 year old mentioned above is in both clips. In the first one he is a few steps behind me and in the final shot you can see him make the pass about 10 meters from the finish line.